*This is a sponsored post as I received these products to test for free as a member of Crowdtap. 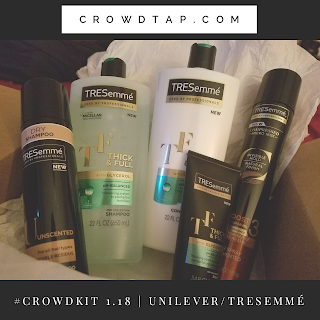 I have received several boxes from Crowdtap since signing up and while most will tell you exactly what the sample is the Unilever boxes are something quite different. Each one usually is a box of products all either similar or covers an array of uses. For example one box might be 5 products of all hair care items designed to help with dry hair while another box might have lotion, deodorant, body wash, makeup wipes and some hair spray. This was something I actually enjoyed the most about the Unilever boxes because it really is a surprise in each one. Everything in this box was absolutely perfect for me! I have very thick hair but I don't always get the best volume not to mention it is extremely damaged so it felt like this box was tailored for me.The shampoo smells like clean the moment you open it and washes so well. I usually do not use conditioner often but my hair has been so dry lately that I have to regularly and this conditioner was absolutely perfect! It didn't weigh my hair down or look oily like so many tend to do. I have been applying the balm after every wash and it seems to lock that moisture in and really prep my hair well for styling. The dry shampoo and hairspray aren't used as often but did a test try on each so I could properly review them. I loved the dry shampoo so much I immediately tossed it in my model bag for those quick touch ups that are so important on busy shoot and runway days! I try not to used any hairspray too often but I really liked how my hair felt after using the compressed mist. Unilever makes such an array of brands and so far I have enjoyed TRESemme every single time I try their products. I have been using a different shampoo from them for years on color treated hair so I can say even without getting their products for free I totally recommend them and the best part is their prices are super affordable so check them out the next time you're in the store and sign up for Crowdtap today to start getting your own free boxes of goodies to try!